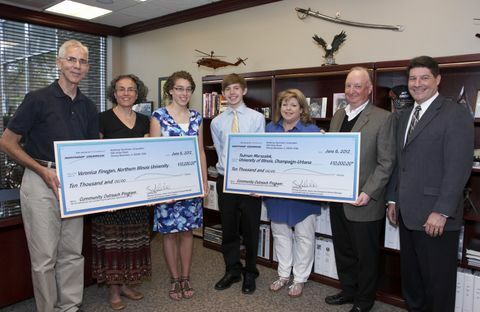 ROLLING MEADOWS, Ill., June 18, 2012 -- As part of its eighth annual Engineering Scholars program, Northrop Grumman Corporation (NYSE:NOC) has awarded two graduating students in the greater Rolling Meadows community $10,000 college scholarships, payable in $2,500 annual installments over four years. Tedman Joseph Marszalek from Saint Viator High School and Veronica Finegan from Fremd High School both received the merit-based scholarship for their excellent academic achievement and community involvement. This fall, Marszalek will study computer science at the University of Illinois in Champaign-Urbana. Finegan is planning to major in mechanical engineering at Northern Illinois University in DeKalb, Ill.
"We are devoted to inspiring our Chicagoland community students' interest in engineering and related fields through our educational outreach programs," said Jeff Palombo, sector vice president and general manager of Northrop Grumman's Land and Self Protection Systems division. "We are always excited to interact with area students. They truly are the future, and we want to support them in following their dreams by encouraging life-long learning in math and science." The Northrop Grumman Engineering Scholars program encourages promising high school seniors interested in math and science to consider the field of engineering. To be eligible, scholarship applicants must be residents of Rolling Meadows, Palatine or Arlington Heights, and be seniors graduating in the spring of 2012 from a local public or accredited private high school. Candidates must plan to attend an accredited college or university as a full-time student in an approved engineering program. Applicants must also meet minimum SAT and grade point average requirements. Further information about the Northrop Grumman Engineering Scholars program is available at http://www.es.northropgrumman.com/engscholars/ .